Children are not small adults. In the urinary tract, particularly, there are many conditions that are more or less specific to children which need early and reliable diagnosis in order to provide proper treatment to prevent renal damage and severe long-term sequelae such as hypertension or renal insufficiency. This is particularly important for all congenital urinary tract malformations and also for many other congenital renal conditions – these are often detected prenatally and, after birth, need prompt and reliable diagnostic workup at minimal invasiveness. Additionally, even in conditions that are the same or similar to adults, the specific needs and conditions in childhood require different imaging approaches and algorithms, partially because of each of the following reasons: the child’s higher sensitivity to radiation, different physiology, different size and imaging appearance, as well as different potential of the various imaging techniques. 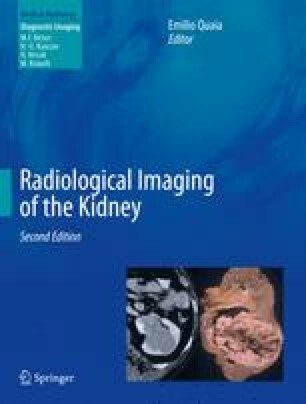 These differences are outlined, focusing on some important diseases and queries such as congenital hydronephrosis and obstructive uropathy, impact of vesicoureteral reflux on the kidney, imaging in infants with urinary tract infection, childhood urolithiasis and nephrocalcinosis, pediatric renal masses, as well as other miscellaneous renal conditions that may manifest in the child and indicate imaging. Additionally, specific needs for adapting and applying the various imaging techniques in childhood are discussed.